From Vermillion, we cruised all day through Minnesota and Wisconsin on our way to Neenah. Unfortunately, we had to pass up some awesome offers to meet new folks in Minneapolis, get a tour of the local public radio station, and hang out on a disc-golf ranch. All things we’ll make time for on the next come through. This time, we had to make it to our friend’s place for trick-or-treating. Having a time-line and a putting dates on things really changes the character of the trip. You just can’t schedule the kind of fun we’ve been having, and this adds some level of stress – no matter how minor – that I’d like to avoid. As I type, there are two more I can think of: Angela’s birthday (Nov 5th – NYC) and Thanksgiving (Texas) that will be pushing us forward. Anyway, more interstate highway today. Long stretches of uneventful driving and 18-wheelers. 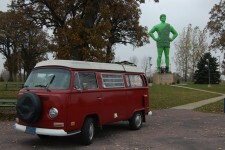 A quick stop in Blue Earth, MN to run around the Jolly Green Giant was about all we had time for today. 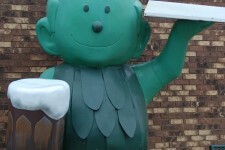 Ho, Ho, Ho, Green Giant. That one. Blue Earth was the title of the first Jayhawks album (my least favorite), so I assume this is it. The all-time best is Hollywood Town Hall, and it’s not too far away from here either. Also, we drove right past the SPAM museum in Austin, MN. We were actually planning on stopping, but the town just smelled like SPAM, so we kept driving. Not a smell I will allow my nostrils to get used to. Drive drive drive sputter. We pull over and I pop the engine lid and take a look. The connector on the choke on one of the carbs doesn’t look right. I wiggle the wire to make sure it has a good connection. SNAP! The spade lug breaks right off the carb. It’s not supposed to do that. There is just no good way to quick-fix this puppy and we’re on the side of the road and it’s cold. Fortunately, Parker sent me away from Whitefish with a soldering iron and I get to put it to use. First, I have to dig up a spare cigarette lighter socket that i just happen to have (future project) and wire it to the battery. Then plug in the mini-inverter, then plug in the soldering iron (add extension cord to the shopping list.) Roadside emergency soldering – a first for me. I solder the wire directly to what’s left of the terminal, fire it up, and we’re on our way again. We cross the Mississippi and we make it to the Strubbes’ by dark. 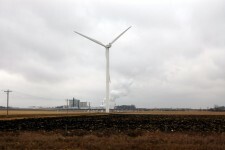 Trivia for you: Blue Earth Minnesota is the halfway point of I-90. There’s a marker along there somewhere that you drove over. Hey Jason, that was some good thinking on that repair. I can see you as the next McGuyver. You were born to drive a VW Camper. I love the way the ads on your blog relate to the story of the day . . . looking now at an ad for Weller parts for a soldering gun! Reminded me that I need to ask Santa for a new one for Christmas. Yay soldering iron to the rescue! That was some slick thinking there! Gotta remember to get a plug-in inverter for the Bumblebus. Hey Jason, if you need to do that repair again and you’re not in a good place to do some soldering, you can adjust the choke all the way open and keep driving. all this soldering talk …. 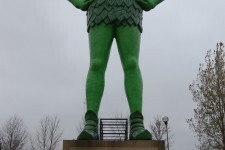 all i can think about is the jolly green giant. i had nightmares about this creature throughout my childhood. true story. and i’m crying quietly to myself that i won’t be in nyc on 11/5. I SHOULD HAVE STAYED! man i’m kicking myslef. Hello brian here,,,If you come to asheville you have a helping hand here…from me and my wife kelly. woops. The camp out is near Winston-Salem, NC. Another Moonie near I95 Exit 33, if your bus needs a check-up or somthing. Also, dont know if you’ve been told about type2.com AIRS list.